After a trot around, we decided it was time to get brave and find somewhere interesting to eat. We had come armed with a list of places to go, partly from the guide book , but also from friends and friends of friends, which was fab. We found a street that had a host of eateries and we dived into a chinese restaurant to sample their delights. There were quite a few fish tanks outside with dinner swimming around in them, but we decided to play it safe and go for shrimp and pork. It was all very good and tasty, served up in a brightly lit establishment with brusque waiters. I love the no-frills attitude there! For pudding we were given a brown concoction, on the house. It looked like mud and really wasn't very appetising-looking, but we had to gulp it down as the owner was standing there staring at us. 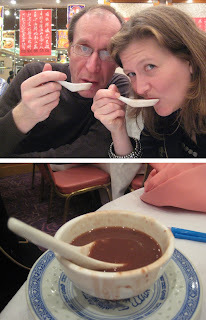 It was surprisingly tasty (a kind of bean-based rice pudding type thing) and we ended up eating it all!